Tech stuff: 744cc, 54 hp, 158 kg, Asso pistons, unleaded converted valve/seat heads. DellOrto PHM41. ClassWorks frame and swingarm. Marzocchi forks, Gazi VMX HiperX shocks, ClassWorks quickshift gearbox and custom UJ transmission. In 1985 Moto Guzzi built three very special 750 bikes to enter officially in the next year PARIS-DAKAR rally race. Two of them were at the start in Paris at the end of that year and unfortunately they did not reach their goal to see the lake rose at Dakar. 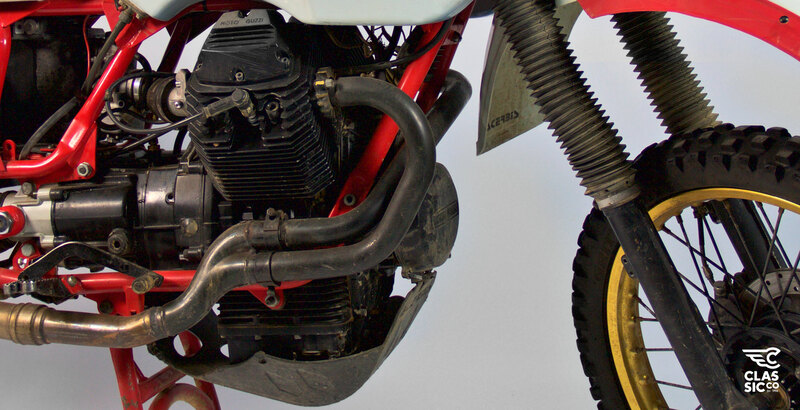 The third bike is still at the Mandello museum and another 12 were built the following year to be sold to privateer racers. In 2011 we finally started building two replicas of the original P-D.
We replicated the frames using the original drawings and fabricated the special swingarms with our own design. 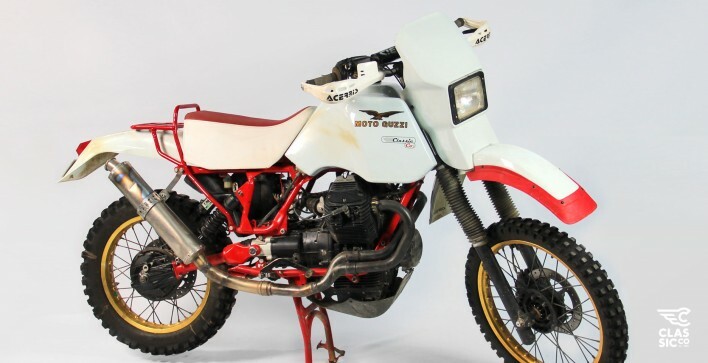 The original idea to make two exact replicas was left aside in order to make a pair of very reliable offroad bikes. We chose a pair of new 750 engines and changed the camshafts fitting our own RS type in order to have a better and more usable power curve. Gearboxes were rebuilt with a mix of different Moto Guzzi 350 and 500 model parts in order to improve the ratio. Modifications on gears and forks to improve shifting was due as well. 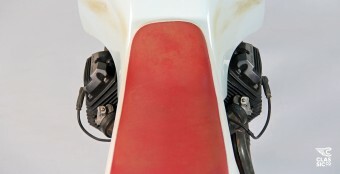 Swingarms are CroMoly steel and 52cm long (original Guzzi alloy swingarms are 46 cm long). Therefore we had to make a new transmission shaft with special UJ to allow for the increase of s/arm angle and wheel travel. 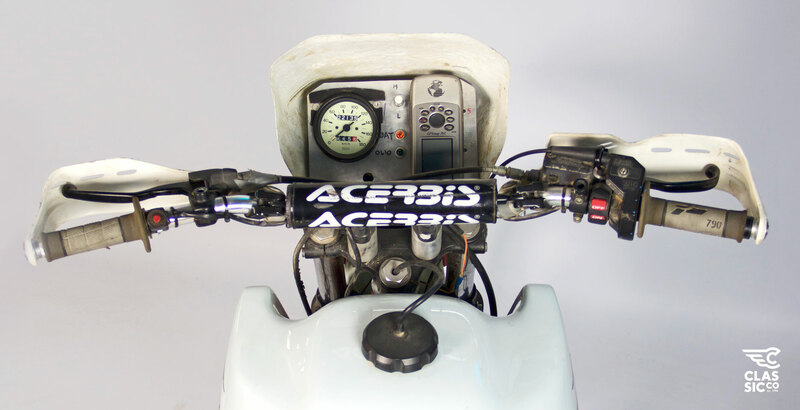 Tanks and fenders are original Acerbis Plastiche. 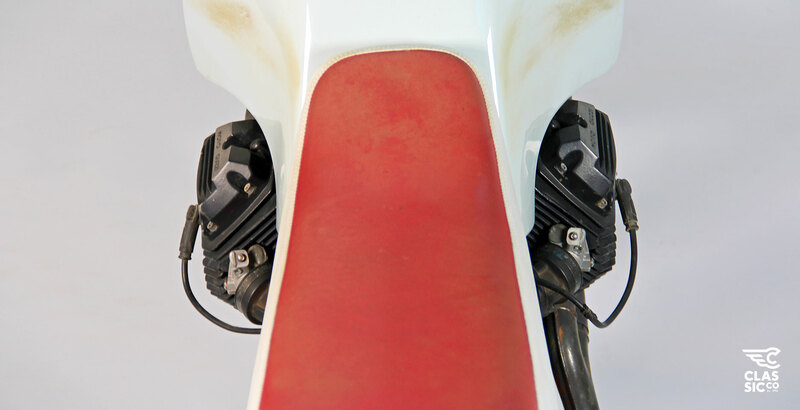 Headlight fairing is fibreglass. There is much more to say about these bikes, we will publish a special article on them with all the details. In 2013 we went to Morocco for a 10 day trial and we were amazed with the results. Since then we have been developing one of the bikes on different terrains and a few national rally races.